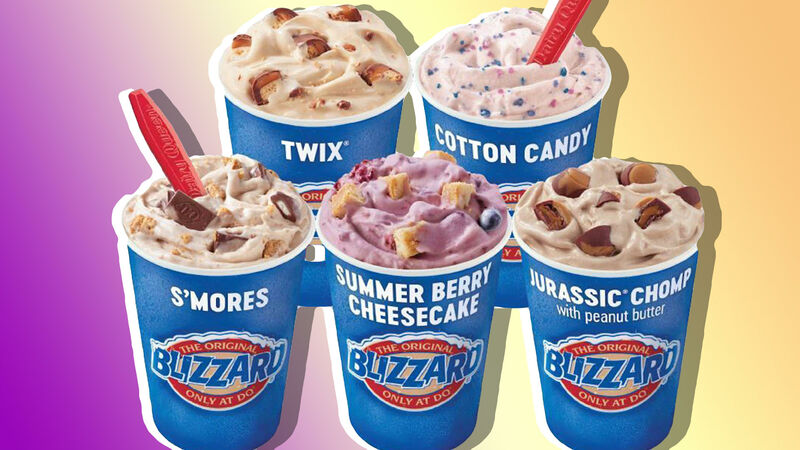 Dairy Queen has done it: It introduced its first-ever Summer Blizzard Treat Menu — with three new and two returning Blizzard flavors. Each represents the summer months so perfectly, from chilled fruity cheesecakes and a s’mores flavor that perfectly capture those weekends spent camping to, yes, watching summer blockbusters in the cool theaters when you just need to escape the heat. And that brings us to the new flavor we cannot wait to try: the Jurassic Chomp, clearly inspired by the upcoming Jurassic World: Fallen Kingdom (in theaters June 22) starring Star-Lord himself, Chris Pratt. Dairy Queen and Universal Pictures partnered up for DQ’s largest mix-in candy ever, with its chocolate-dipped peanut bites and a fudge topping blended with that creamy vanilla soft serve. Pure heaven in a cup. This isn’t the first time Dairy Queen introduced a Jurassic Park-themed Blizzard to its menu, though. In 2015 when Jurassic World hit theaters, Dairy Queen began serving the Jurassic Smash Blizzard. Another menu item returning as part of the Summer Blizzard Treat Menu is the S’mores Blizzard with a delicious blend of marshmallow-filled chocolates and graham crackers. Also back by popular demand is the Cotton Candy Blizzard, a sweet mixture of cotton candy pieces and colorful sprinkles. Both are served with vanilla soft serve, of course. Also on the menu is the new Summer Berry Cheesecake Blizzard, made with cheesecake pieces and real raspberries, blackberries and blueberries. If cheesecake isn’t your thing, then you can grab the new Twix Blizzard topped with caramel. It doesn’t even end there. According to the release, DQ will introduce two other Americana-inspired treats later this summer — so keep your eyes peeled for that. Plus, they’re offering a fan experience for the new Blizzard menu in the form of “experiential rooms” — designed by interior designer Nate Berkus — that not only aim to bring each flavor to life but also help raise funds for Children’s Miracle Network Hospitals. If you’re in the Manhattan area, head to Big Screen Plaza, where DQ will unveil the S’mores Blizzard Treat room and the Cotton Candy Blizzard Treat Room on May 23 from 5 p.m. to 7 p.m. ET. The aforementioned summer-inspired flavors are available now at DQ and DQ Grill & Chill locations nationwide for the entire summer.